As if we weren't already excited for the upcoming film adaptation of "Divergent," Sephora is giving us another reason to wish it was March already. The beauty retailer is releasing a "Divergent"-inspired limited-edition collection that's slated to come out next month. Although this line seems to be following in the footsteps of CoverGirl's "Hunger Games" collection, the "Divergent" palettes come in a range of neutral colors that are great for everyday wear. As Sephora's first movie makeup collaboration, we're pretty impressed. 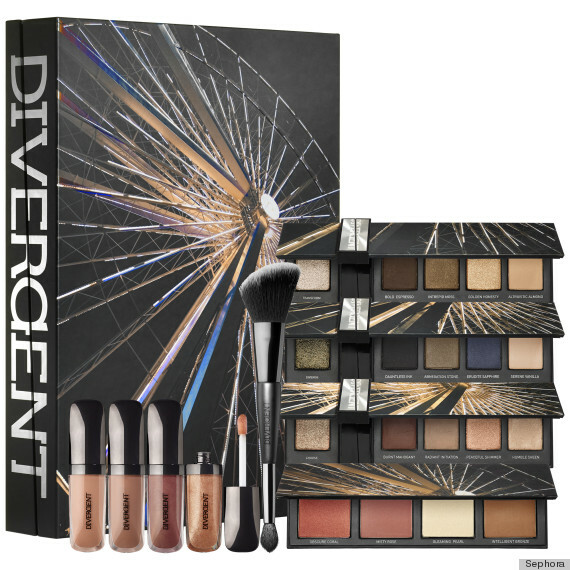 Sets include the Multi-Piece Collectors Kit ($59.50), the Multi-Piece Collector's Palette ($32.50) and a 7-Piece Nail Art Kit ($27.50), all of which derive shades and blends from the different factions that exist in the "Divergent" world. The most intriguing pieces are the High Pigment Eye Shadows and High Gloss Transforming Shadows that are transparent when dry, but show up translucent when wet. In a press release, the magical eyeshadows are described as "showcasing fluid, twinkling particles that look like they are suspended in air" -- so basically, we can't wait to slather these shimmering pigments all over our faces. We couldn't help but think of leading leading Shailene Woodley, because by the looks of it, this collection was definitely made with her in mind -- and we're not complaining, because the actress has rocked some stunning makeup looks in the past. Get this future distopian greatness online and at Sephora stores, including J.C. Penney locations in early March.